*This post is sponsored by The Home Depot. I have been compensated for my time and provided with product in exchange. All opinions are my own. I have so much cool stuff to tell you guys!!! If you follow me on Facebook or Instagram (which you should), you got a little taste of some of the recent awesomeness. I'm able to keep providing ideas and share new project with you guys largely thanks to sponsorship from brands that I love and use. You guys are important to me. I don't want to steer you wrong. I have never and will never endorse a company or product that I don't personally use and stand behind. Basically, if I wouldn't recommend something to my best friend, you won't see it on this blog. From the first project I ever built, I dreamed of working with The Home Depot. I grew up taking trips with my dad to Home Depot almost every weekend, and I frequent my local store so often, they know me by name. I've been lucky enough to participate on a few virtual parties, like my Table Top Football game, and Decorative Wheelborrow and have even contributed to The Apron Blog from time to time. 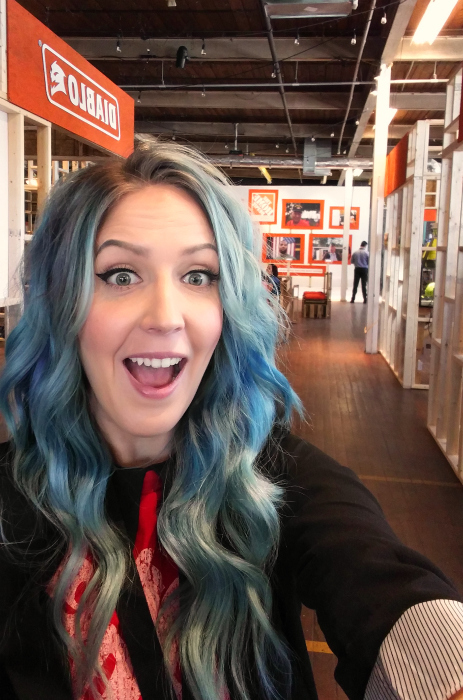 When I was asked to participate in The Home Depot's new tool review program and attend the ProSpective event in Atlanta, I almost peed myself. You guys, it was SO good! Not only did I have an amazing experience, I learned so much and got a sneak preview of some super awesome tools coming down the pipeline. The best news is, you guys will have the chance to get your hands on some too. 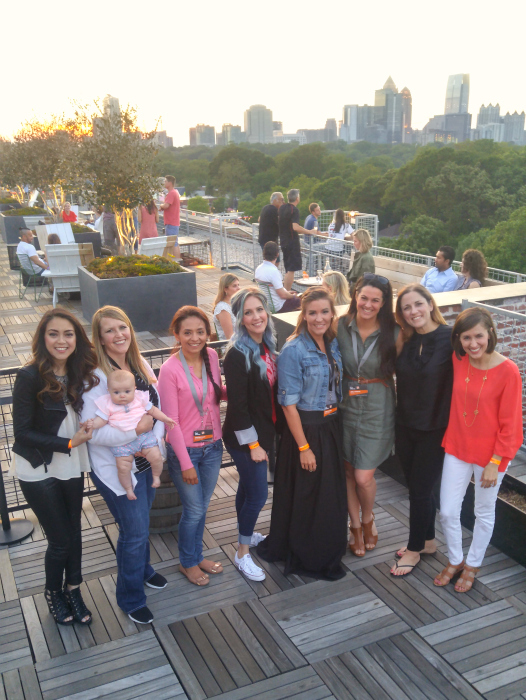 So what happened in Atlanta last month? The first day we loaded up on a bus and headed to The Store Support Center (A.K.A. headquarters), which has got to be one of the coolest office buildings I've ever seen. In addition to their own private Starbucks, the building houses their testing facility. We got to watch how they perform quality control and make sure the products they sell will perform. The second day is when the ProSpective event went into full swing. 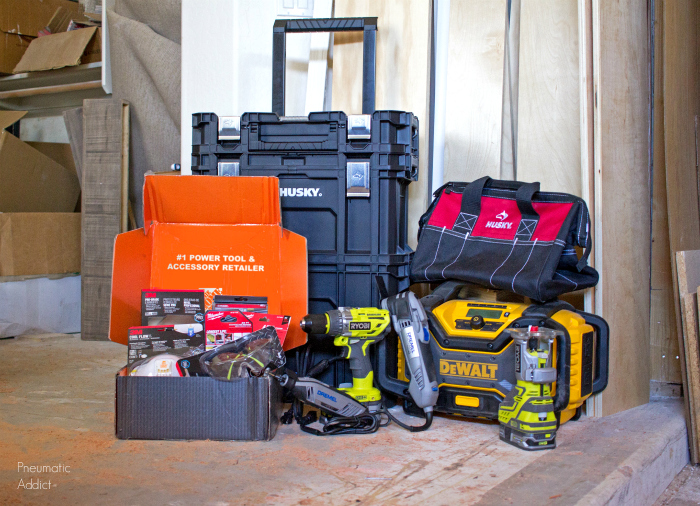 Imagine a warehouse full of your favorite tool brands, right next to each other. I met with representatives from Husky, Paslode, DeWalt, Ryobi, Rigid, Diablo, Makita, Bosch, and Milwaukee. They explained all the new technology they are implementing and we got to try out some of the new products. I'm seriously impressed friends. These tool companies are so stinking clever and are really stepping up their game. Imagine bluetooth controlled batteries and sandpaper that doesn't clog. I can't wait to show you! That night The Home Depot treated us all to an amazing dinner and games. 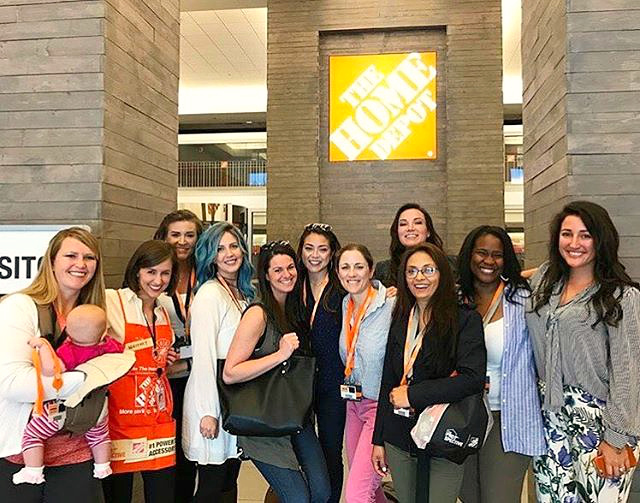 Not only did I get to hang out with my best friends, we got to meet with some the buyers (the people who choose what Home Depot sells) and executives. They actually listened to what we suggested and really demonstrated how much THD cares about their customers. The third day of the event is what I'll remember. 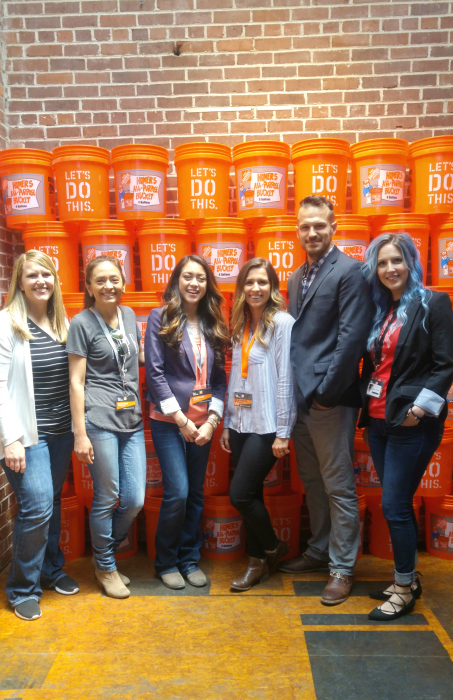 Have you heard of The Home Depot Foundation? Through volunteers, they partner with thousands of nonprofit organizations to deliver aid and ongoing support in the community. 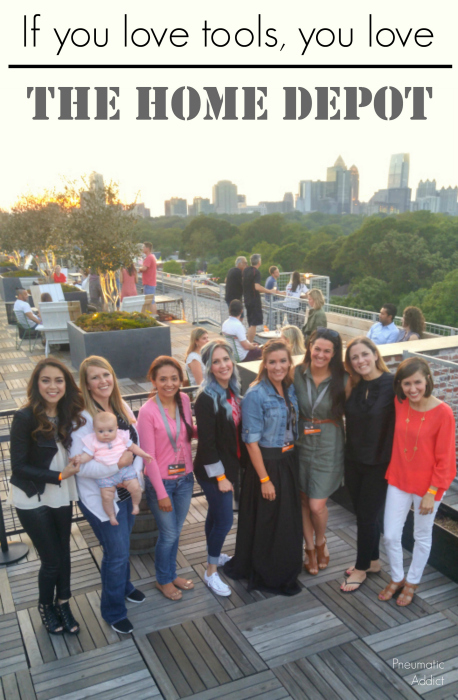 All of the bloggers and brand reps loaded up on buses early that morning and we headed to different locations. 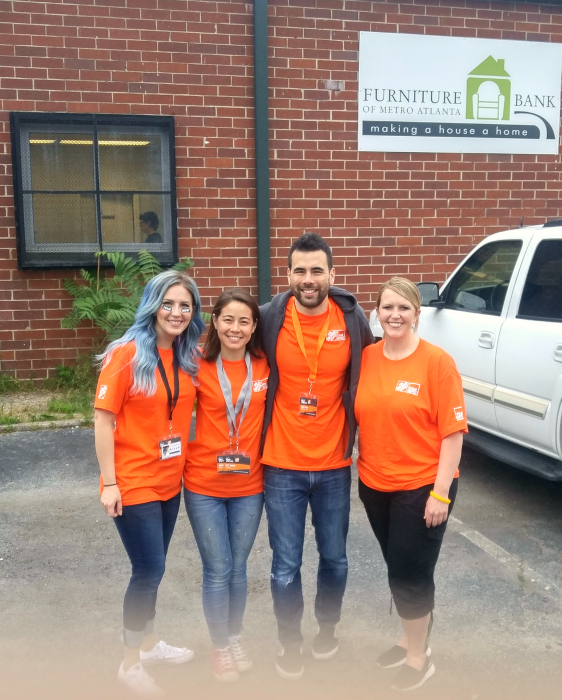 My team went to The Furniture Bank Atlanta and rolled up our sleeves. 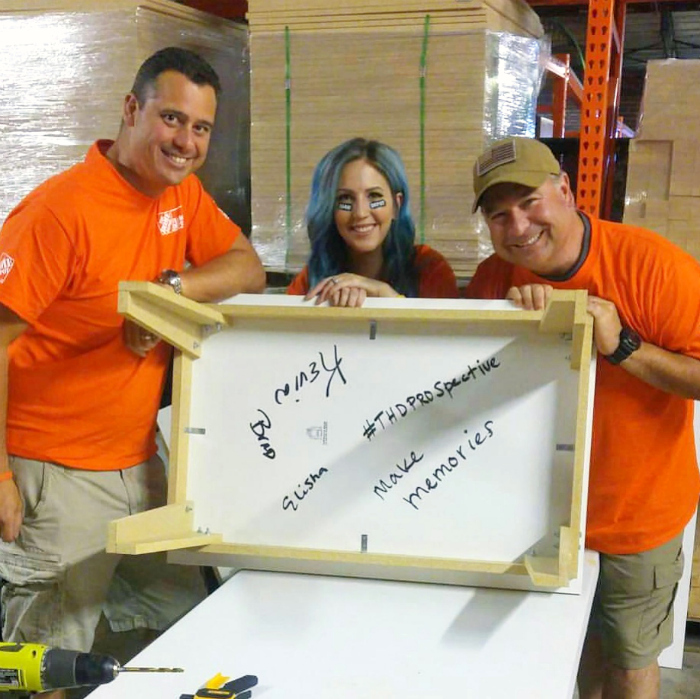 Brad from THD and Kevin from Diablo Tools and I knocked out 2 dining tables and 3 coffee tables for families in need. It was the perfect way to end an amazing trip. So what does this mean for you? Awesome tools my friends! Over the next year I'll be reviewing the latest and greatest tools and accessories from your favorite tool brands. Just look at the good stuff from this quarter. You'll get to see the good and the bad and maybe get your hands on some. I'll be hosting giveaways for the really cool stuff, so make sure you're following along. Enter your email in the box on the top of my page to get my latest blog updates right in your inbox!